There are series of unfamiliar issues you can encounter while seeking admission. Especially with JAMB now giving admission through a coordinated system called CAPS. One of such problems is when a school gives you admission into a course you didn’t choose during UTME registration or change of institutions/courses exercise. Imagine being lucky to be offered admission under JAMB CAPS but you later discovered that course given was different from the one you’re longing for. Then, a message stated that you have to accept the course and make a change of course or your admission could be revoked after two (2) weeks. Yes, you read it right. Some candidates had been offered another course than the one they initially applied for. If you find yourself in this situation, what does it mean and what should you do immediately? Why I’m I offered a different course from the one I applied for? There basically two reasons for this. Your school of choice didn’t have enough spaces to accommodate more applicants for the course you wanted. Hence, they resolved to offer you a new (usually related) one. You didn’t meet up with requirements for the course you initially chose. You might have had one or two limitations in your JAMB score, Post UTME score or your O’level grades. One of these may lead to being offered a different course. Accept the offer and make the change of course. This is what most wise applicants will go for. Especially if you don’t have any admission hope from another school and you can still do well at the new course given. After that, you’re required to effect the change of course in your JAMB profile. Change of course should be done on JAMB portal strictly (except your school instructs otherwise). Note that the change will cost N2,500 excluding the café service charge. After that, recheck your admission status on your JAMB profile dashboard. It will now reflect the new course. Then, proceed to print JAMB admission letter. One usual question is, can I still do the change of course after two weeks ultimatum given by JAMB? However, you don’t have any reason to delay things. Hurry up! JAMB has said it all. You can reject the admission offer if you don’t want it and open yourself up for another school to offer you space. You have to be careful here though. If you reject the admission offer without any certainty that another institution will chase you, you may lose out this year. 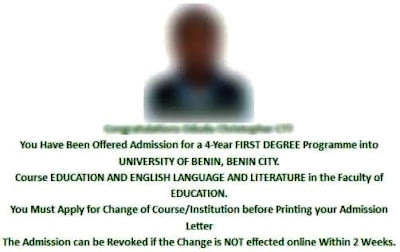 But if you’re sure you merit admission of another school (usually chosen as the first choice, passed their post UTME and beat the cut off mark), then you may reject it.